DADaPalooza: Life Isn't Fair: You Need to be Prepared. Life Isn't Fair: You Need to be Prepared. About a week ago, a friend of mine from the WELL (Whole Earth 'Lectronic Link) died in his sleep unexpectedly. He was 46 years old. He leaves behind 2 young kids, a devoted wife, and a huge community of friends, acquaintances, and colleagues who all have a huge hole in their heart where this guy used to be. I am one of those people. I knew him for about 15 years, although we met only a couple of times. Most of our interaction was online. And even then, it's not like we shared secrets, or were best friends, or even were online together all that much. We were in the same community, and I admired the hell out of his writing and his wit and his creativity. And although I certainly have less claim on grief than his family or close friends or high school buddies or college friends, it doesn't make my hurt any less. He's the third guy in the last two years I know that has died tragically young and unexpectedly of a heart attack. The other two were performers, this guy was a software coder and entrepreneur. In the last 11 months he had dropped close to 50 lbs and was by all accounts loving life. My friend's death is a tragedy, and has me in a bit of a tizzy. Of course, part of the sinking feeling in my heart upon hearing this news is "It could have been me." I'm 48, I've been heavy all my life, and for the last 4 years at least, would be classified as morbidly obese. (I'm relatively fit-I can swim a mile in under an hour and go for 30 minutes on the elliptical, so it's not all bad). But still. I've been suffering from slightly high blood pressure, and the beginnings of arthritis and a bunch of other stuff, including gout and sleep apnea. Much of it exacerbated/caused by my weight. About a month before my friend passed, I'd made a commitment to lose weight, and have lost about 25% of what I need to to get down to a healthy weight. (I still have a long way to go-- 75% to be exact) I'm hoping to reach my target weight by my birthday in 2014, when I will be 50. Slow but steady will win this race. But this news blows me a way a little, because it struck home to me the fact that it doesn't matter. You can plan and be fit and lose weight and live a clean life, and you know what-- when it's your time to go, it's your time. Ready or not, here death comes. And I'd rather be ready. Here's a few things you can do to get ready. 1) HAVE A WILL. 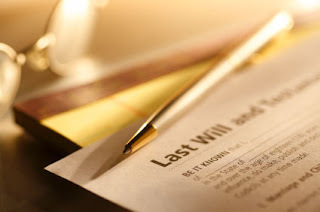 If you aren't protecting your family with a will, all of your assets go into probate when you die, which makes it very difficult for your loved ones to get the money that they need without you in the picture. A will makes it clear where the money should go, who is in charge of it, and can make it easier for your spouse and children to stay protected. 2) HAVE INSURANCE If you've got kids, you need some kind of life insurance. I'm not an expert, but at the very least, your life insurance should cover the cost of your mortgage, your outstanding debt, your funeral, and between two-five years of living expenses. This will give your survivors the opportunity to figure out what they want to do next. 3) TALK IT OVER If you've got a spouse, you should talk to him/her about your wishes. Buried or cremated or frozen? Establish scholarships at your University or High School or Place of Worship? Mozart or Led Zeppelin or They Might Be Giants at the funeral? If you don't talk with your spouse about it now, you won't get what you want, and you might be unprotected. You should also talk to your close relatives and friends. If both of you die at the same time, what happens to the kids? Do you have a plan in mind? I highly recommend the NOLO books for their organized take on WILLS and estate planning. There are also lots of executives, lawyers, and account planners (if you have a larger estate) that will be happy to work with you to get your stuff in order. If you need a recommendation, send me an email-- I'm happy to give you a couple of ideas about how to find someone in your area. In the next few weeks, I will be crossing my t's and dotting my i's on my will, my life insurance, and all those other things that comprise estate planning and long-term thinking that I've been avoiding, because I don't need to think about that yet. I DO need to think about it, and so do you. Because Life isn't fair, and you need to be prepared.